Excel Hobby Knives have a 4-point chuck to prevent slipping, and they come with a safety cap. Each knife includes one blade. They are individually packaged in a plastic tube. 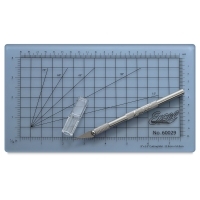 Hobby Mini Precision Cutting Kit — Great for small jobs and easy to transport, the Excel Hobby Mini Precision Cutting Kit includes one American-made Excel K1 hobby knife plus a clear, self-healing cutting mat. The knife includes one #11 blade and safety cap. The mat measures 5½" × 9". K2 — Aluminum handle, 6¼" long, with #24 blade.